Nice older bud vase made of ceramic with a soft white matte glaze by Napco in the Provencia pattern. 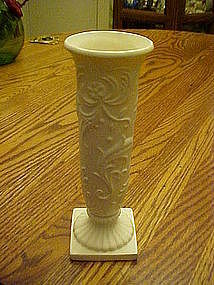 Has pretty scrolls and flowers on the vase with petal pattern on the foot of the base. Measures just over 6 1/2" tall and is in great shape with no chips cracks or repairs. Marked on the bottom E-3033.